After 2 days of rest, we were all set for Nubra Valley expedition and were thrilled for crossing Khardung La. Started at around 8 AM for Sumur, the village in Nubra Valley, about 120 kms from Leh. Right after you leave Leh, the uphill journey starts, just going up and up. Mountains of Karakoram range in the front, deep valley on one side and stunning landscapes of Leh behind, the 40 Kms stretch of the journey till Khardung La (also known as K Top) is experience in itself. 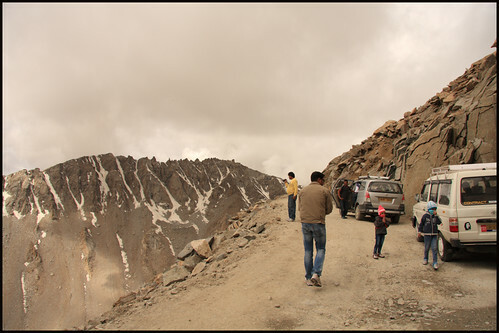 And when you are nearing Khardung La, you will feel the altitude of 18380 ft. seeing everything beneath you. The magnificient view on the way We were advised not to stop at the top of the pass while going and instead do so on the return journey, the rational behind it being, in case you seriously suffer due to oxygen deficiency, you cant go ahead to Nubra valley and have to return to Leh. But we did stop with moral support from Dorjee ! Hardly after 2-3 minutes after alighting, we felt the breathlessness, getting a feeling as if blood supply to brain was cut apart. It was too tiring to walk event to the nearby restaurant. Air was cold and mountain tops covered with snow. Hot Maggie and tea brought much of a relief. After spending half an hour, we left the Top for Sumur. 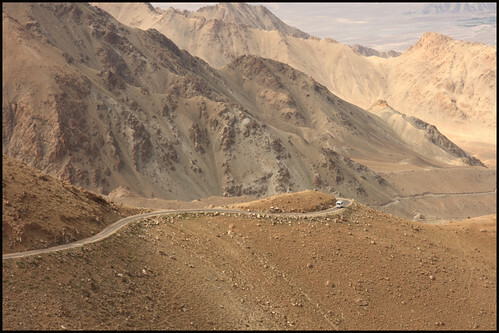 The journey from Top towards Nubra Valley is a stiff descend. The road around the Top is not in a good condition due to frequent landslides. Once you are on top, you can see only three colours, blue sky, gray mountains and white snow. Absolutely no plantation on such high altitudes. But as you start descending, greenery start appearing slowly. 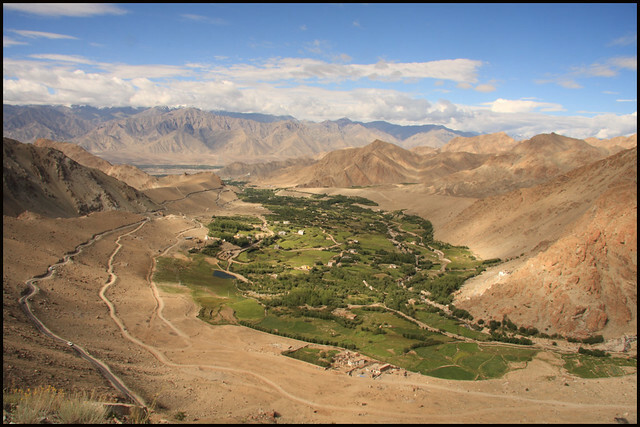 You can see the vast expanses of Nubra valley filled with patches of greenery and white sand and basin of Shyok river. 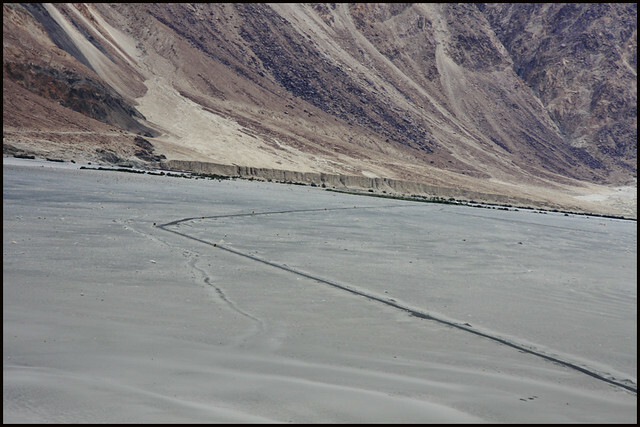 The journey continues on the banks of Shyok river till Khalsar where it meets Nubra river. At Khalsar, one road goes to Hunder and the straight to Sumur. When at Khalsar, you are completely down in the valley and can feel the very pleasant atmosphere of valley. 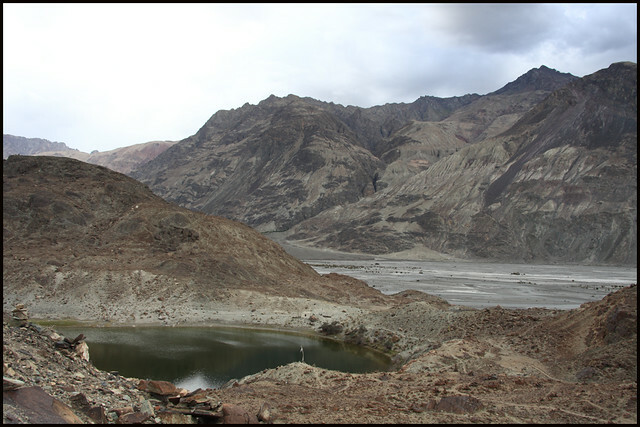 From Khalsar, we drove northwards 20 kms to reach Sumur, road was really good on the banks of Nubra river. Reached the camp (The Ladakh Camps) in Sumur at around 1 pm. The camp is at a very calms and nice location in Sumur village. 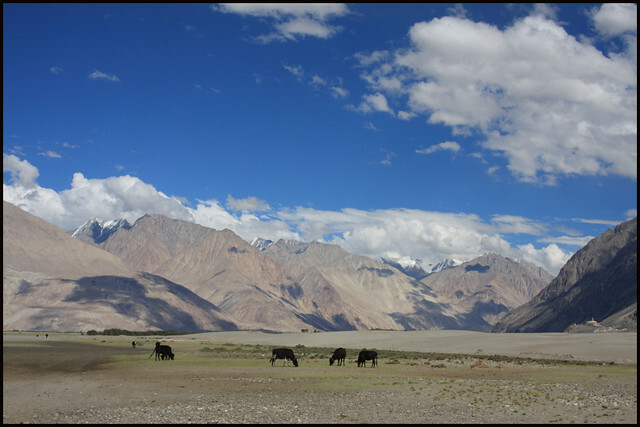 Pleasant Nubra Valley We didn?t have any specific plan. So decided to go till Panamik, 28 kms from Sumur towards north. The journey along the banks of the river was memorable. Much fun was experiencing rain shower with clear skies due to water drops brought by the high speed wind. Yarab Tso We passed through lush green plantation, white basin of the river filled up with stones and water streams and surrounded by mountains. You don?t see any mountains facing the direction of the car but only the really wide basin of the river. Panamik is the last village beyond which only Army and locals are allowed. From here, the base camp of Siachen is hardly 80 kms. Wish some day, this road too would be opened for tourist. On the way back to Sumur, Dorjee gave an idea of small trek to Yarab Tso (lake) which is on small hill in the basin of the river. We drove right across the basin to the foot of the hill. Half an hour trek and you see this beautiful lake on the top of the hill. This is a sacred place for local people. The best thing was there was absolutely no one there and we could spend the time relaxing and enjoying the beauty of the lake. Before returning to the camp, we stopped at 2 places to see the hot water springs. We woke up early and wandered about the place to see the village life. Sun showering its first rays on the mountain tops, ambience filled with fresh n cold air and locals taking their herds for grazing, the morning two hours walk was all refreshing. The road through the cold desert We started our journey for Hunder, drove back 20 kms to Khalsar and then took right. The road passes through the white sand dunes, a thrilling experience like movie scenes. This was a one of the very different vistas Ladakh offers. Driving through the lonely road, white stones and sand on both the sides amidst the mountains. After one hour or so, we drove uphill towards Diskit Monastery, the monastery famous for its mind blogging location. The monastery is picturesque of all the monasteries and you can see its beauty from different angels as you drove towards it. The view from the monastery was mind blowing show casing vast basins of Shyok river, mountains and green landscapes. We spend 2-3 hours in monastery visiting various temples, talking to monks and enjoying the beautiful views around. View of 106 feet statue of Lord Buddha on the backdrop of the valley is stunning. After visiting the monastery we went to the temple housing this mammoth statue. 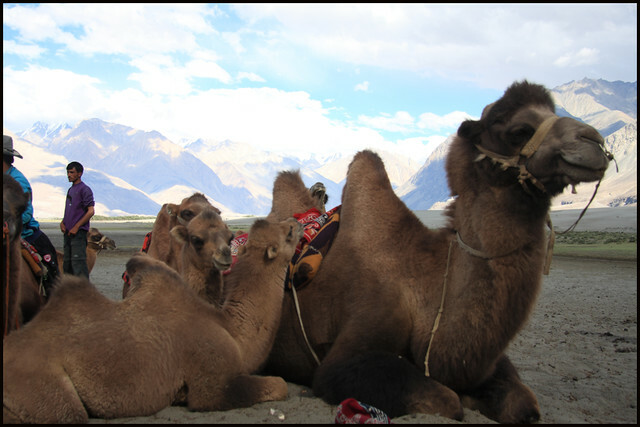 After Diskit we drove right to the camp (Nubra Sarai Camp) in Hunder village. This camping site is very much near to the Sand Dunes. The garden around the tents was so beautiful, we decided to sit on the chairs and enjoy the surrounding. At 4 pm, we started for the Sand Dunes safari. Reached there just in 15 minutes. Two humped camels Two humped bactrian camels were waiting for us on the white sand dunes. One hour safari was a fun especially for kids. Unlike the usual camel safari, riding was much comfortable as you can sit at ease between the two humps . After the safari we spent time wandering here and there. A crystal clear water stream flows across the sand dunes. Though very chilled, it was fun playing in the water. After 6.30 pm, wind started showing its presence and it was difficult to stay there. We drove back to the camp to watch the evening symphony of colors.... the changing colors of sky, mountains partly lit with the setting sun, the rainbows and dark clouds and magical colors of twilight! 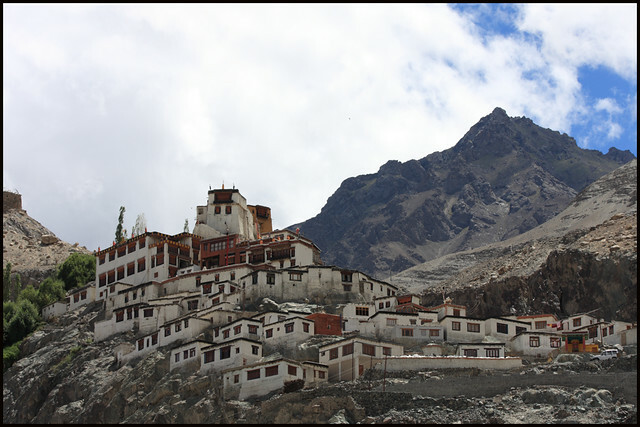 After the deep sleep in the night, spend some time wandering around the village and left for the return journey to Leh. With full day in hand, there wasn?t any hurry to reach Leh. So we enjoyed every stop on the return journey, stopping for tea at every other restaurant we came across, seeing Yalks, walking into the river beds and all time pass we could do. Needless to mention the stop at K Top. This time we got stuck in traffic just before the top for half an hour. Thanks to the army men who cleared the mess soon. The experience at K Top was bit adventurous as we felt high altitude sickness much severe than the previous one. Dorjee told us it was due to sunny day. Still we made our expedition to the restaurant to have tea and left immediately for Leh. 40 kms downhill didn?t take much time to reach the hotel in Leh. Rest of the day was at leisure which we spent in hotel resting and remembering the heavenly stay we had in Nubra valley and planning for the next expedition - the great Pangong Tso.